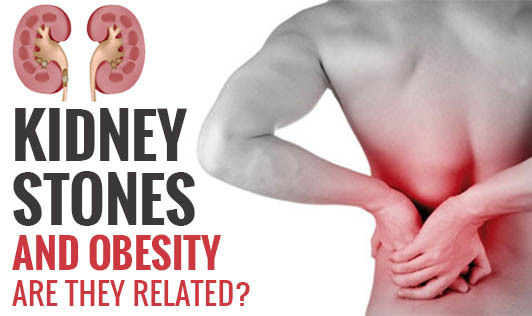 Kidney Stones and Obesity - Are they Related? Being obese or gaining weight increases the risk of developing painful kidney stones, and women may be especially vulnerable to this condition. These kidney stones are formed due to increased levels of dissolved minerals in urine. Obesity has previously been linked to prostate cancer misdiagnosis, heart disease, stroke and joint problems but new research involving 241,623 subjects has also linked it to an increased risk of kidney stones. The results were reported in the Journal of the American Medical Association. Researchers believe that accumulation of fat increases insulin resistance causing changes in the urine. These urine changes can lead to kidney stones. Women appear to be more at risk because they generally have more fat than men. Study results indicate that a 16 kg weight increase after the age of 21 increased the risk of kidney stones by 40% in men and about 80% in women. Researchers warn people to avoid obesity in order to prevent kidney stones which occur in roughly 10% of all men and 20% of all women. The main takeaway is to stay away from sugar filled drinks, sodas, colas and go to something natural like plain old water.